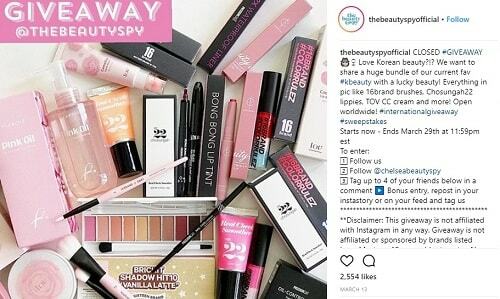 If you’re struggling to gain traction on Instagram, running Instagram giveaways might just be your ticket to getting attention from the platform’s millions of users. After all, everyone loves free stuff, right? 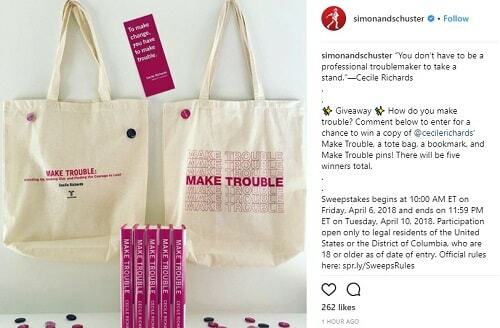 An Instagram giveaway done well means more likes, follows, and shares – plus, these contests can be a lot of fun for you, too. “But how do I set up an Instagram giveaway?” you ask. 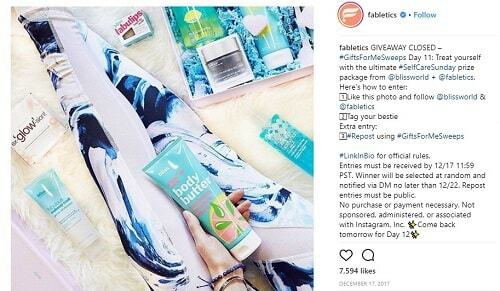 Or, “What can I possibly give away that will get people interested?” If you’re not sure where to begin, don’t worry – we’ll cover the basic types of Instagram giveaways and eight stellar Instagram giveaway examples that get results. How Do Instagram Giveaways Work? Like to Win Contests – These are the simplest Instagram giveaways to run. Because you’re simply asking people to follow your account and like a post, you’re not taking the risk of alienating anyone by asking them to do something outlandish (like post a selfie – gasp!). Tag a Friend – In this giveaway, followers are asked to leave a comment and tag a friend in your post for a chance to win. Post a Picture (or Selfie) – Ask followers to post a picture relevant to your brand (such as using or wearing a product) along with a contest-specific hashtag. If you’re not requiring selfies, you’ll get better engagement from any selfie-averse followers. 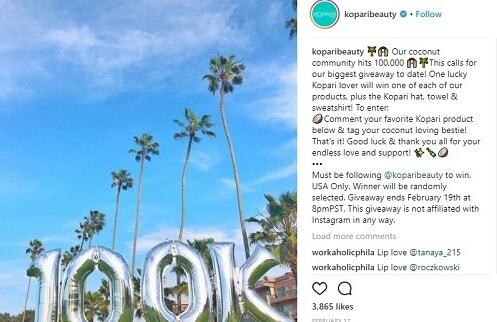 While a lot of Instagram contests operate similarly, you can combine and mix up the requirements to boost engagement – but if you’re asking your followers to jump through several hoops, make sure the prize is worth it. And don’t forget to follow your usual Instagram best practices, like posting at the ideal times to reach your audience. Not sure which type of giveaway to run? Here are a few examples of amazing and well-executed giveaways for more inspiration. 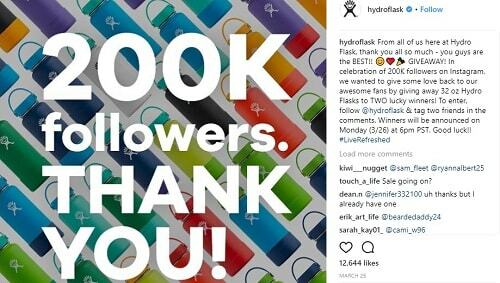 In this giveaway, Hydro Flask celebrates the milestone of reaching the 200k followers by running a contest to earn a few more. They asked fans to follow @hydroflask and tag two friends in the post comments to enter to win a 32-oz. Hydro Flask. The post has more than 12,500 likes – engagement anyone? And the best part? Two winners = better odds of winning! Similarly, Kopari Beauty celebrated its milestone of garnering 100k followers with an amazing giveaway. While there’s only one winner, the lucky winning fan scored one of every Kopari product AND a Kopari beach towel, hat, and sweatshirt. To enter, followers must comment on the post with their favorite Kopari product and tag a friend. Diaper-eez knows how to package an Instagram giveaway for maximum benefit. The prize is a Colibri Double Duty Wet Bag plus a hanging diaper pail. 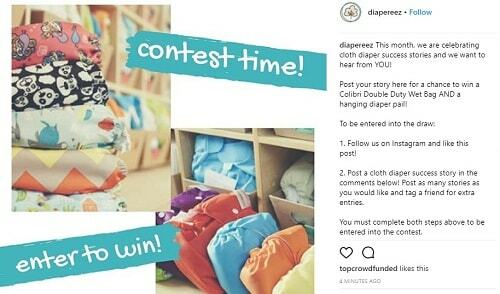 To enter, fans have to follow @diapereez, like the giveaway post and comment on their cloth diaper success story in the comments. Followers can post multiple stories and tag a friend for extra entries, giving the brand tons of engagement plus a built-in way to gather user-generated content. This is smart marketing at its finest. One lucky winner scored a slew of beauty swag in this giveaway. To enter, fans had to follow @thebeautyspyofficial and @chelseabeautyspy and tag up to four friends in the comments. They could also score a bonus entry by reposting the contest post in their Instastory or on their feed and tagging both accounts. This is a smart strategy for boosting follower numbers and brand awareness for related brand identities. 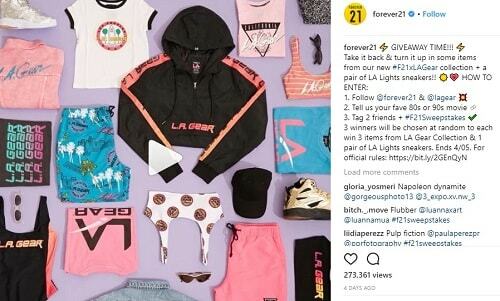 Forever 21 gets nostalgic with this Instagram giveaway, giving three lucky winners three items each from the LA Gear Collection, plus a pair of LA Lights sneakers. Almost everyone older than 10 in the 80s remembers (fondly or not) the LA Gear brand, Forever 21 ties in the old-school theme by asking fans to comment with their favorite movie from the 80s or 90s, follow both @forever21 and @lagear, and tag two friends for a chance to score some LA Gear swag. Last (but certainly not least), how about a chance to win $10,000? 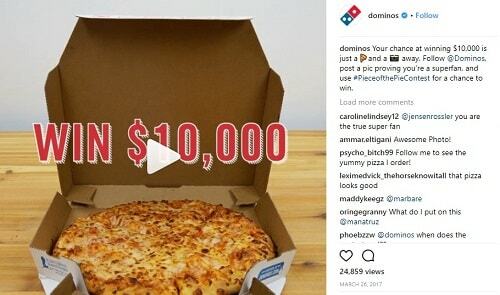 While a $10k prize may be out of reach for smaller brands, you can take a cue from Domino’s and run a giveaway with a worthwhile reward that motivates your audience to engage with your brand. But are you a fan, or are you a superfan? For a chance to toss their name in the ring for an amazing $10k prize, Domino’s asked fans to share a photo that proves their superfan-dom using #PieceOfThePieContest, and it didn’t even require a selfie (although we’re sure pics of enthusiastic pizza-stuffed faces didn’t hurt anyone’s chances of winning). Want An Effortless Way to Get More Instagram Followers? Running a giveaway on Instagram is a great strategy for getting more engagement. You can get even more engagement from Instagrammers by installing our Instagram follow button. Beautiful, quick to install, and easy to configure — our Instagram follow button is designed to help you instantly grow your audience on Instagram. Take 5 minutes now to install it, then sit back, and watch your Instagram follower number grow! Need more followers on other social media platforms?